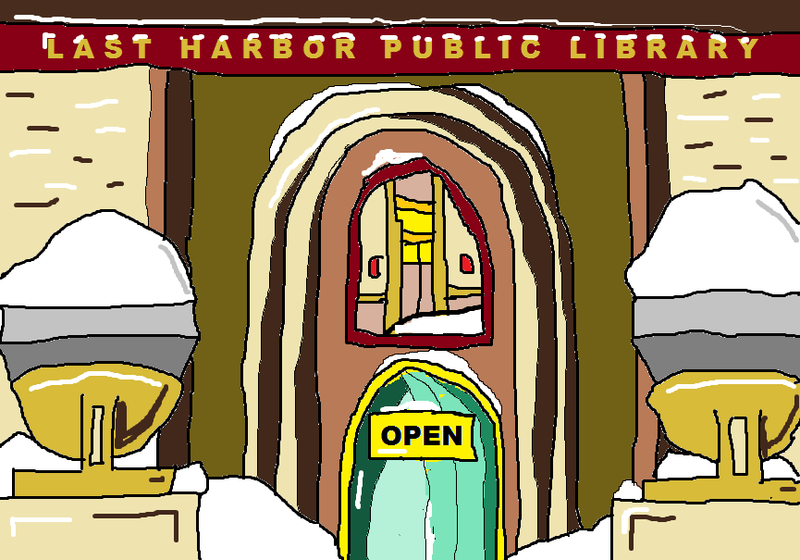 This is the fifth post in the blog of The Last Harbor Library. The first post concerned our blogger, Nate, being instructed to write a blog, for the library, by the imperious leader of The Last Harbor Library, Amelia Browning. The post can be found here. The second post is too complicated to explain and is recapped a bit in the third post anyway. It is here. The third post is about the staff not working and is here. The fourth post is about the library in winter and is here. Explanation for this blog within a blog can be found here. Last Harbor's blog as a separate, but only barely fleshed out at this time, entity, can be found here. Anyone curious enough to hop onto the Last Harbor Public Library Blog probably knows the basic facts about our library, the kind you'll get on any five cent tour you might take of it, or from a quick scan of its Wikipedia page. You know it's considered to be Frank Lloyd Wright's last masterpiece and that it was built by Northern Minnesota's most famous (and only) billionaire, Everett Browning. You also probably know about how he built it for his daughter (on tours I like to make the joke that the Last Harbor Public Library is thus a children's library, which is funny because our kid's section is about the size of my thumbnail). Because I have spent the last few years working here, and delving into the idiosyncrasies of this library's history, I am well acquainted with a vast array of little known facts about our famous library. When I conduct a nickel tour of this building (as I often do) I include the best of these facts. But I see no reason not to lay out these little known facts here, and save us both the trouble of a tour. If you're still smitten with the Last Harbor Library and have to come for a visit, I suggest you take the ten cent tour. If I'm your tour guide you may want to say "You'd better skip to the even littler little known facts" and I will endeavor to do so. 1. There was no budget for the building of the Last Harbor Public Library. Wright was supposedly told by Browning "It's simple. Build what you need to build. I will pay for it." 2. Amelia Browning, for whom this library was built, was nine years old at the start of construction. She was considered a genius, and was said to be involved in the library's design. While this seems preposterous, seeing photos of young Ms. Browning lecturing the elderly Wright, who looks on fascinated, does a good job of changing most people's minds. 3. No material in the building of the library comes from more than 300 miles away. Funny thing is nearly all the books do. 4. The Last Harbor Public Library is a public library. There is a veritable encyclopedia of documents that gives Amelia Browning absolute control of it, but it is open to all and is supported in numerous small ways by the city of Last Harbor as a public institution. 5. Amelia Browning wrote a book of poems when she was 12 called Mr. Wright Builds a Library. It was published. It was pretty good. Our library does not carry it. 6. Frank Lloyd Wright was concerned that the library would be overcome by the overwhelming views of Lake Superior. His original design strongly limited dramatic vantages of the Lake and limited lake facing windows. In each design revision (there were 14) he added more windows facing the lake. 7. The Last Harbor Public Library only has rare books by accident. The library (read: Amelia Browning) is interested in the content of books and circulating them, not in their physical value (I believe I have heard her use the word "fetishists" in this context). 8. Though most people viewing our collection assume we must be some kind of academic library, we are actually very much a popular library. The vast majority of books in our collection were very popular at some point in the past 5,000 years, just, very, very few are so now (very, very, very, very few). 9. There is a secret room, but it's not much of a secret if I say more than that. 10. The Last Harbor Public Library has opened every single day, 365 days a year, for 17 straight years now. I don't know, mystifying, eh? This post attracts so much bizarre spam I find myself especially touched that your post doesn't read "Why aren't you famous? Check out my site cheapqualitysneakers.com." Maybe I am famous amongst lunatic spammers?